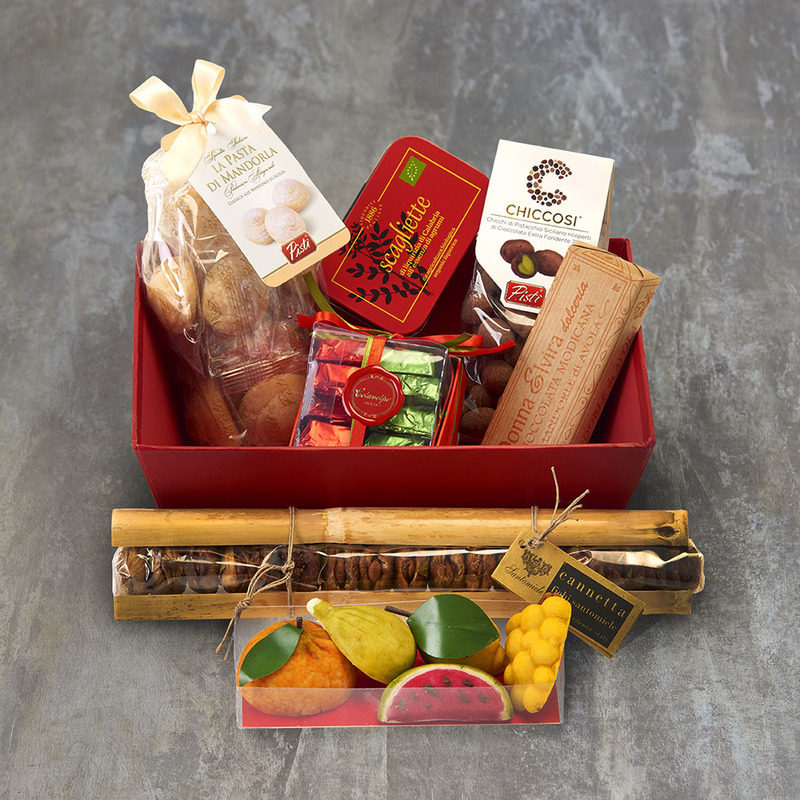 Heaven in a box for sweet-toothed friends, relative or colleagues – this hamper contains a selection of our most indulgent Italian sweet treats from Italy. Chocolate Fig Bites (200g) Selected dried Calabrian figs baked in the oven, flavoured with vanilla and covered with extra dark chocolate. Presented in a small, round wicker tray. Dark Chocolates filled with Limoncello Cream (100g) Luxurious Grand Cru dark chocolate (min 75% cocoa) from the Dominican Republic filled with a burst of Mediterranean flavour. Dark Chocolate filled with Coffee Cream (100g) Exquisite hand made Gran Cru extra dark chocolates (75% cocoa) filled with coffee cream. Dairy free Modican chocolate with Bronte Pistachios (70g) Made in Modica, Sicily following an ancient Aztec recipe, this unique, crumbly chocolate bar is a must for chocolate lovers! It's free from cocoa butter and animal fats and has an intense pistacho flavour. Dairy free Modican chocolate with Bolivian Mirror Salt (70g) Made in Modica, Sicily following an ancient Aztec recipe, this unique, crumbly chocolate bar is a must for chocolate lovers! It's free from cocoa butter and animal fats. Set of 4 Calabrian citrus marmalade (40g each) This set of 4 typically Calabrian citrus fruit marmalades includes bergamot, cedro (citron), mandarin and lemon. Scagliette (40g) Pure Calabrian organic liquorice pieces flavoured with aniseed in a sweet little tin. Our sweet treats are presented in a bright red hamper tray which is wrapped with cellophane and a big red ribbon. A gift message option is available at the checkout. Please note that if we are out of stock of any item we reserve the right to substitute it with the most similar available item. Allergens: almonds, soybeans, pistachios, nuts, milk, eggs, wheat. Dark Chocolate Fig Bites are made in an establishment that also uses nuts, milk, sulphites, sesame, eggs, gluten and soy.